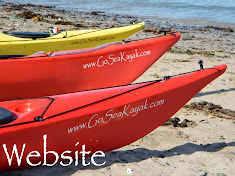 Today I met up with Noel & Stuart at Aberthaw with the intention of paddling to Lavernock & back. There was no chance! It was forecast F5-7, sea state 5 & for once it actually was. Evan more when the squalls hit. This is more like it. There's fab swells running into the harbor & I think we all caught some fab waves. Noel caught a fab wave too & I wish I'd got a picture but he finished by bongo sliding straight towards me, had to paddle hard to get out of the way. We played in the swells heading in & out on the surf. Playing around the cardinal marker. And trying to surf into each other? A moment of calm. The whole morning came in phases of rough & calmness. Doesn't look like it here but there was some huge waves pushing between the cardinal mark & the headland & was definitely the best spot for surfing. We coax Noel further out for a play, you can just make out his head. It was just after this I did a couple of rolls, very bad idea! serious ice cream head! I paddled out further back to the headland where the biggest swells were coming in, seemingly ignorant of the very strong wind, unaware in my excited anticipation that a squall was about to hit. I surfed a couple of big swells & then everything went nuts. I was pointing my head down to keep the hailstones out of my eyes & trying not to get blown over or capsize on the suddenly very choppy water. I head further in to see how Stuart & Noel are? Noel had legged it, (or armed it? LOL) back to shore against the wind & Stuart was in the middle of the Bay unable to turn around. We sit it out for a bit but it was getting worse & we were being blown towards shore so I suggested we surf in. Gotta make it to the breakwater in the distance. After it calmed down we paddled back over to Noel Where Stuart stayed, I wasn't done yet & wanted some more playtime so I head back out to the cardinal marker. Caught a few more swells & then down came the hail again, without the high winds this time. 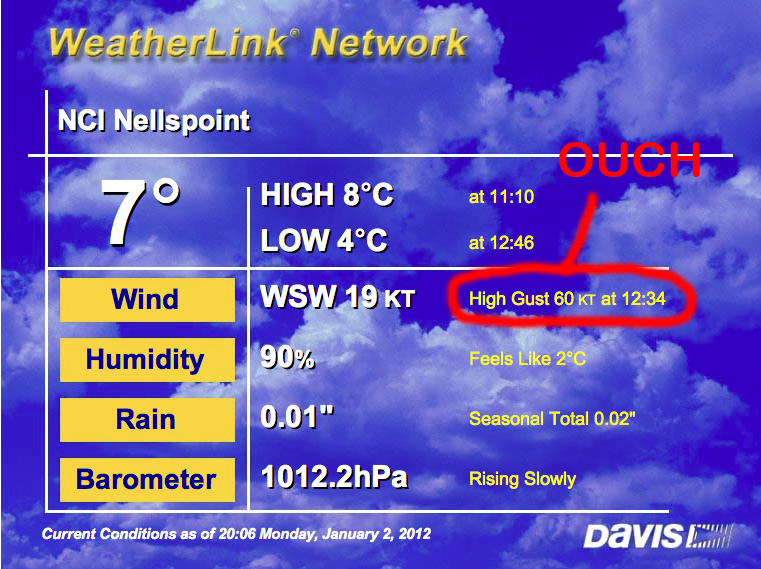 Stuart told me about this afterwards, 60 knot gust during the squall, thats 69MPH, (WOW) no wonder we were getting battered! I walked the dog over the Old Harbour in the morning and I had never seen it that rough. It looked good practice but sort of glad I couldnt make it!!!! Sounds a fab day - pity I couldn't make it in the end - would have been excellent training! I bet you're really disappointed - just another four knots and you would have been paddling in Hurricane Force 12. Jules, just what exactly are you training for?